I finally got around to ordering a new pair of Brooks Adrenaline GTS 10’s! I discovered Brooks Adrenaline last Spring when I had a special fitting done at Fit 2 Run in Sarasota, Florida. I suffered from chronic blisters for a couple years and it caused me a lot of frustration not knowing why I kept getting bad blisters with every pair that I tried. 1) Contrary to what I thought, I am not a severe over-pronator. My feet are actually fairly neutral (with slight over-pronation only), so the sneakers for over-pronation that I was buying were incorrect for my feet. 2) I have a very narrow foot. My heels swim in normal width sneakers. Hence: bad heel blisters! The beauty of the Brooks Adrenaline? They come in a special narrow width and they hug my heels like a glove! I’ve had many fittings, but the one I had at Fit 2 Run was the only one that solved my problem. I highly recommend them if you are in Florida. 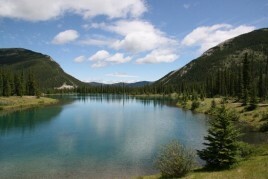 This week is my Fall Back Week in my half marathon training, so it is the perfect time to gradually break them in. And there really is no gracious way to go from talking about feet to food, so I will just get right to it before I put my foot in my mouth. Today’s recipe is courtesy of Elizabeth who is the first winner in the Valentine’s Day Recipe Contest! Eric said he picked this recipe because no one would expect him to pick a non-chocolate dish. I love the mental games he plays. He will be selecting two more (or possibly 17) recipe entries by tomorrow, so stay tuned. 1. Heat 1 tbsp olive oil in pan over medium heat. 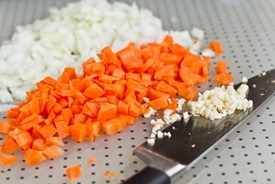 Add chopped onion, carrots and garlic and sauté until the onion is translucent. Add broth, quinoa, salt, and cinnamon and bring to a boil. Reduce heat to simmer, cover and let sit for 20 minutes or until liquid is gone. Be sure to keep an eye on it and stir it often so it doesn’t burn. Remove from heat; stir to fluff. 2. Meanwhile, heat oven to 350F and toast almonds. Roughly chop toasted almonds. 3. Heat 1 tsp olive oil in a nonstick pot or skillet. 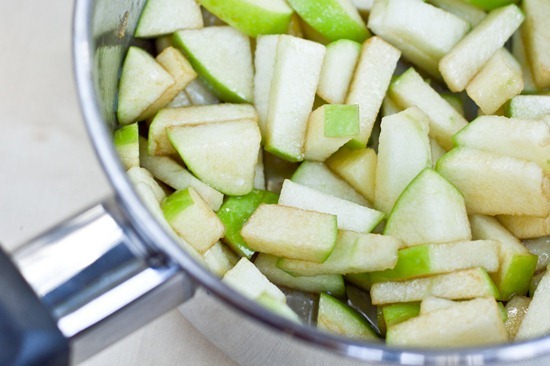 Add chopped apple and vanilla and sauté for about 5 minutes until apple starts to turn golden in colour but before it gets mushy. 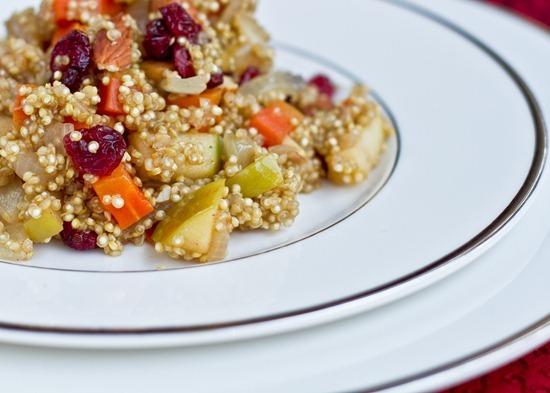 Add apple, almonds, cranberries and pepper to quinoa and mix thoroughly. Serve hot or cold, as a main dish or a side with a protein source. Makes about 3-4 cups. 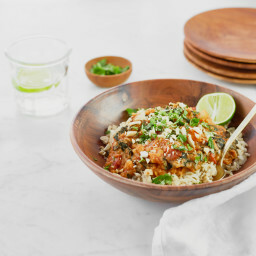 This dish is packed with nutritious ingredients! 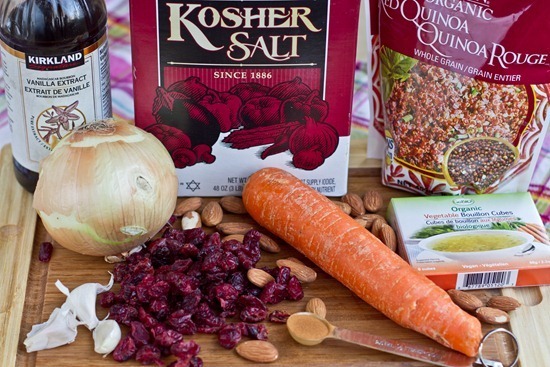 I started out by using red quinoa because I thought it would be festive for Valentine’s Day. 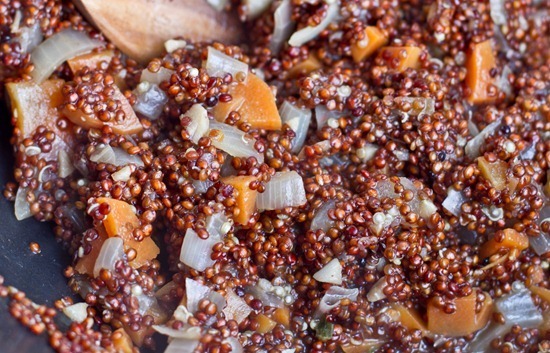 Unfortunately, my red quinoa never got fluffy…even after 30 minutes of cooking! I have no idea why it remained crunchy and would not cook. Has this ever happened to anyone else before? Because of my wonky red quinoa, I had to start over from scratch. It was a bit soul-crushing! 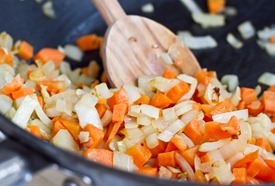 Bring to a boil and then cover and simmer for 20 minutes. Be sure to check it often and stir so it doesn’t burn. Luckily, this quinoa got really fluffy like it should. 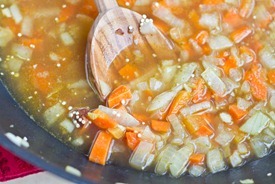 When I first tried it, I decided it needed a bit of sweetness to offset the vegetable broth flavour, so I stirred in 1 tablespoon of pure maple syrup. It really brought together all of the flavours nicely. This dish is very light and it would make a great lunch dish. It reminds me a lot of the Mandarin and Maple Quinoa Salad that I made a while back. You can enjoy it warm, at room temperature, or even cold. It is quite versatile. Eric and I served it as a side dish and then we had a hunk of the Ultimate Lentil Loaf leftover from our party on the weekend. It was a great meal! Thanks Elizabeth, please email me to claim your Glo bakery loot! Update: Just tried the leftovers and they were fantastic straight out of the fridge! I’ll be back Friday with a flourless double chocolate cookie recipe that changed my life and rocked my world. I actually made it in December 2010, but I didn’t get a chance to post about it before Christmas and it fell off my radar. I figure Valentine’s Day is a great time to whip it out. muhuhaua. If you want to prepare in advance you will need the following ingredients: ground flax, shredded coconut, brown sugar, cocoa powder, baking powder, baking soda, salt, almond butter, almond milk, vanilla extract, and chocolate chips. One thing is for sure: It is always best to be prepared when chocolate cravings strike! That looks delicious! Honestly I love just about any dish that uses dried cranberries. I just love them! 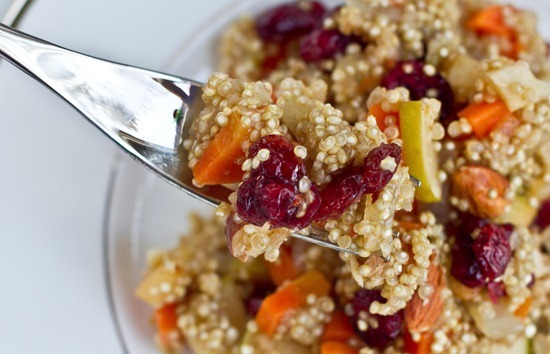 Love this sweet and savory quinoa! I love the pop of color in the dish!! It looks like this could really cheer you up at the same time as being comfort food. Yummy! What a beautiful dish. I heart quinoa. I’ve been eating a lot of it lately. I want to try baking with it more too! Mmmm I love, love, love dishes like this. Any main meal that has hints of sweetness are a thumbs up in book! The quinoa salad is beautiful!! 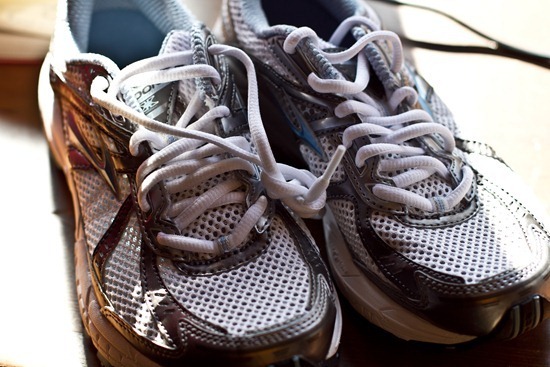 I hear you on finding shoes that fit…or else getting blisters or injuries. It’s been a lifelong problem for me b/c i can’t fit into women’s sizes, have to wear mens, which are wider, which cause blisters…oy vey…. This actually looks like a perfect Valentines day dish. Lots of colors (including the red cranberries), and the bit of savory to offset the sweet! I like running barefoot best but if someone would come up with a super light-weight shoe that fits sort of like a moccasin then I would buy it! As of now it’s barefoot or Vibrams (which are over priced and wear out fast)! This looks so good! I love mixing sweet & salty! ***how did you know, ELIZABETH?! 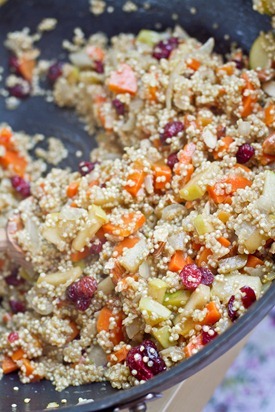 Just the other day I made a sweet quinoa dish for the first time in months (coconut milk, cranberries, cinnamon, cardamom, and quinoa = yum), so I’ll be trying this soon! The staying-crunchy thing I’ve had happen with millet – very frustrating! The flourless cookies sound fantastic, and right up my alley! And this quinoa, delicious! I do something similar with pears + dried apricots. So tasty. How did you run so much in the wrong shoes???? I lasted 2 months in the wrong shoes and found myself at Runners Roost literally baring my soul to the shoe guy…. “My feet hurt when I run!”. I have high arches & a neutral pattern and wore stability shoes….. yeah. Bad combo! I’m glad you found the right sneaks, the wrong shoes can really throw a wrench in the works. I need to get some new running shoes, thanks for reminding me! And funny, I am going to be in Sarasota in 3 weeks. I am going to have to look up your Florida posts and get some ideas for places to visit! This looks perfect for a summer picnic, oh how I wish it was summer! Will keep the recipe to try when the sun is shining and it’s warm enough to sit outside. I do love quinoa and this looks so light and fresh. Delicious!!! Love the narrow width option too! I need it and it helps so much. I love all things cranapple and almonds! Do you think this would work with cooked quinoa? 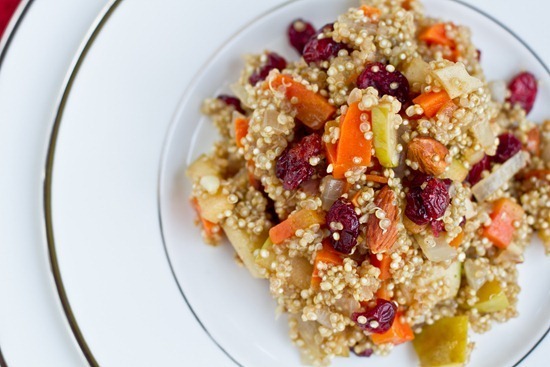 I love anything that has quinoa in it – this looks so good! That is such a pretty dish. I love quinoa with fruit! Ooh, that looks phenomenal! I have a bag of fresh cranberries that I’ve been trying to use for forever- do you have any idea if it would be possible to sub the fresh? And what I’d have to do to make it work? This looks awesome! 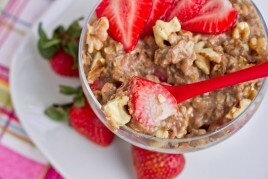 I love sweet grain dishes like this one. Looks delish! Do you have any suggestions on the best way to “wash” the quinoa? I’ve only tried it once by putting the quinoa in a mesh colander and rised it under the faucet, and it still came out kind of bitter. Do you soak it and then rinse it? Maybe I just needed to rinse longer? I totally gave up after a disaster a couple weeks ago. Maybe someone else has tips! This looks beautiful! I’ve been loving quinoa lately, especially for breakfast. It’s such a nice way to switch things up when I normally have cereal or oats. Great recipe! I’m sorry about your red quinoa! I get so frustrated when that kind of thing happens that I’m usually tempted to just call it quits :-/ Maybe your quinoa was old or stale, if you got it in bulk or something? That’s happened to me with split peas before, they stayed hard after hours of cooking! In any case, this dish looks fantastic and I can’t wait to try it. I have the Brooks Adrenaline aswell and I LOVE them!! 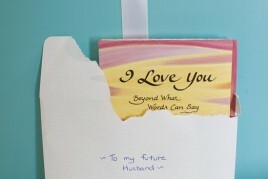 I hope you like them just as much!! Yours definitely look a lot nicer than mine lol. This dish looks interesting and delicious all the same… I may have to add it to my list! this looks so luscious!!! beautiful! this maybe one thing my friends like that i do! I have Brooks Adrenaline running shoes, too! I did a whole post about them in December when I first got them. I could NOT believe a running shoe could be so comfortable! the salad sounds delicious. I love it when fruit is incorporated into salads- perfect sweet and savory combo. hope the new sneakers break in nicely! Ohh what ascrumptious dish! 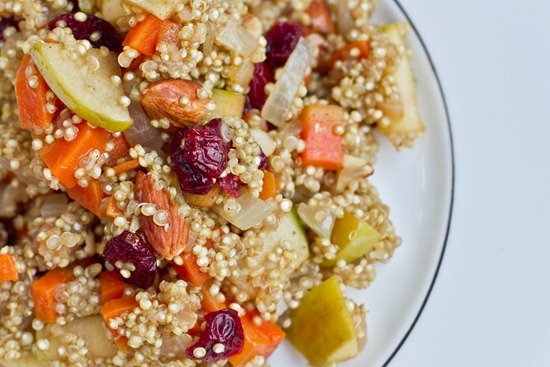 Cranbery, apple, and almond sound like they’d be absolutely lovely in quinoa! i think i’m going to make this! It is very unlikely you will remember me. Eric will enlighten you. I will send an email to you soon. I have an opportunity for you to help a couple of people who are beginning what you are expert in. And besides, I wanted to comment because I believe you might benefit from a token man on your excellent blog. I run in Brooks Adrenaline 10’s too! I’ve been wearing them for two years now and though I’ve tested out other shoes none compare to these. I love how they fit my feet and the amount of support they provide. I am going to need to make sure I have the ingredients for those cookies. I had a chocolate the other day and made your choco-cado pudding. It is absolutely amazing! I LOVE my Brooks! I used to run in Nikes and always got a really bad calf cramp. Turns out that I do overpronate and I had the wrong shoe. I started with Brooks and loved them. Then when it was time to get a new pair, I tried Mizuno, then Asics, and then went back to Brooks. Bottom line, Brooks are great for my feet. My husband swears by the Asics, guess it all depends on what type of foot you have! By the way, remember when I mentioned I was having a weird pain in my ankle. Well, hubby suggested orthotics, and what do you know? I no longer have ankle pain – woohoo! I even ran the other day (a very short run), and no issues! Tell Eric that looks like a good choice! I was actually talking to someone yesterday about grain alternatives and this person said they didn’t think quinoa had any flavor. I said you just have to do it up right… Like this! Yum! That looks so beautiful and fall-like! Yum! I might do a variation on this dish. Love the combo, but I’d make more of a breakfast version I think. Thanks for the idea! This looks delish! I’m a newbie to your website and already tried 2 recipes. LOVED them! The TRUE ROOTS organic qunioa that I get at Costco is prewashed. Thank Goodness! I am putting this dish on our Valentine’s menu as we do meatless Mondays in our house and it looks wonderful.. AND I have all the ingredients. Love that. This looks great…I’m wondering, in the list of ingredients it says 1 TBS plus 1 tsp divided. Is that Olive Oil? I’ve definitely had that red-quinoa-not-getting-fluffy issue. I’ve found that the only way it works for me is if I 1) have very little in the way of other ingredients in the pot with it (besides liquid), 2) KEEP THE LID ON, 3) have the temperature up a little hotter than simmering, 4) cook it longer. It takes me about 30 minutes. I had the same problem recently with my red quinoa – it was really chewy, but I didn’t mind. I think maybe it needed to be rinsed longer and cooked a bit longer maybe…I have no idea actually. Isn’t finding a good shoe magical. I love my Nike Frees. LOVE. 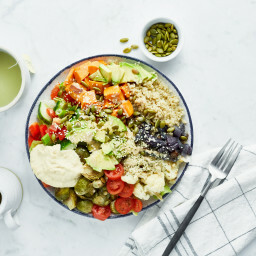 I have been looking for a light and easy quinoa recipe to bring as a dish to pass for Easter – this will be perfect – thanks! 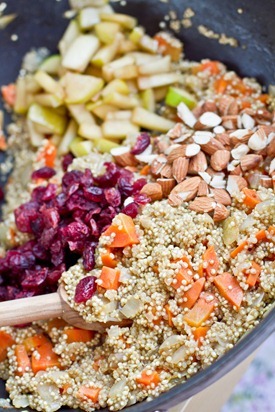 Yum–I love quinoa with all kinds of different textures thrown in–this looks fabulous! Eric ‘playing mind games’ by picking something that doesn’t involve chocolate = BWAHAHAHAHA SO FUNNY! Such beautiful pictures of that quinoa salad. I’ve never cooked with red quinoa… seems odd that they just wouldn’t cook. I once made a beans soup and didn’t soak the beans and they never got soft. Was def annoying, but at least I knew why… argh! I love getting a new pair of shoes ! :D I’m almost due for a new pair myself… must head to the running store. This looks great and very similar to a dish I made for thanksgiving. 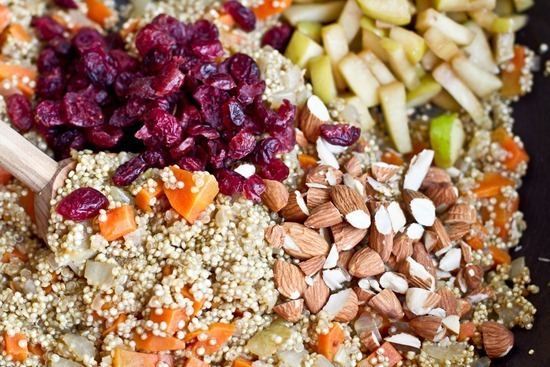 Quinoa goes so well with dried fruits and nuts. Very interesting about the shoes, I’m in love with my current ASICS GEL-Kinetic 3 after discovering I’m an over-pronator and my last shoes caused slight hip and ankle pain because of it. The quinoa recipe looks amazing, light and fresh. Can’t wait to try it – thanks! Can’t wait for the cookie recipe! I’m always trying to find things to replace the coconut in recipes though, yick! I keep thinking I should go to a shoe store for them to tell me what kind of feet I have, but I just can’t afford to buy any new shoes! That’s so weird about the quinoa, I have never had quinoa take longer than 15 minutes. Looks like a yummy recipe though! Quinoa is my favourite grain! What a colourful way to “jazz” it up! Great runners girl, happy running!! What a coïncidence! I bought the same running shoes just last week, and I’m loving them! Though they feel new, I haven’t had any major issues yet. Hope they work for you too! Yummy! I need some healthy delicious quinoa recipes and this one looks especially good. I’ll basically be checking back here every 15 min for your cake recipe. I am so making this! It looks delicious. Maybe the red quinoa doesn’t cook well in veg broth with other ingredients? That’s weird though, I’ve never had that happen before! Mine always ends up pretty fluffy. Hey I was just sitting here thinking what can I bring to great wolfe lodge ..yum .. so happy I have everything I need … going to make it right NOW! Thanks .. nice shoes!! I have those very same heels .. thanks for sharing your tip! what absolutely beautiful colors in that recipe!! that looks great! did you take all of those pictures in the lightbox you built? I love Brooks shoes, well made. They fit me feet well. that quinoa dish looks amazing! I think this must be the prettiest quinoa dish that I have ever seen! Now that is saying a lot since I have been around the quinoa block ifyouknowwhatImean (that makes it sound like I’ve been skanky with quinoa, eh? hehe). OMG OSG!!! Just finished making this, Braedon said it was really good and I added a 1/4 cup of Boathouse Farms C-Boost juice to use it up. Can’t wait to try it cold .. that is if there is any left!! Will try it on the gang at GWL! 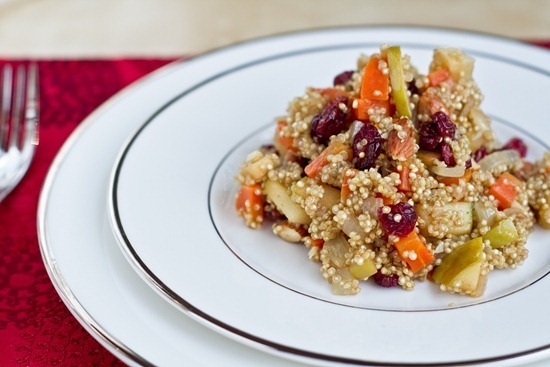 Quinoa dishes are so great because they are healthy and light, yet full of protein. Can’t wait to try this one out! Just wondering if you rinse your quinoa before cooking it? I have read that you should rinse the grains, but wonder if it makes a difference?? Sounds like alot of extra work, and I doubt those little grains are very easy to rinse! I have cooked red and normal quinoa (both washed) and find that that normal one does seem a little “lighter” than the red. But I actually prefer it less light because otherwise it sort of just blows everywhere. 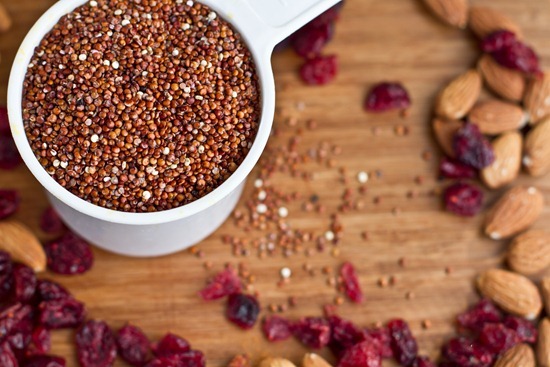 The red quinoa was not crunchy or anything… not sure why that happened to you… sorry! This looks so good! 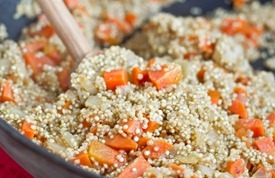 I love quinoa and use it in so many dishes! I have that same problem with red quinoa, I find that the regular stuff usually comes out a lot softer, even without soaking it on those lazy days! That looks so good! Was it red quinoa in the pics? It looked like regular quinoa… I just started using the red quinoa when I saw your recipe with in in a soup… i love it!!! Thanks for all of your awesome recipes! Looks beautiful. Light, fresh, and pretty! Can’t wait to try it. This would be a great idea for stuffing! <3 your website! You are SO inspirational and because of you, I am gradually going to vegetarian and maybe one day, vegan! Mmm, delicious. And I too love my Brooks Adrenaline GTs! Just got my 12s a few weeks ago, with purple trim! I just made this dish; however, I substituted dried cherries for the cranberries, per your suggestion, but also coconut milk for the vegetable broth. I then added 1/8 tsp of cumin. I liked it, but my quinoa was mushy. Could it have been the coconut milk or possibly that I overcooked the quinoa? I’m fairly new at cooking vegan dishes and have not had much experience with quinoa. Also, I have not been very happy with many of the vegan recipes I was finding but have been motivated to stick with the program due to a health issue. 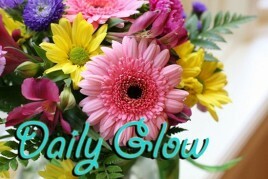 I am SO THANKFUL that I stumbled across your web site!!! I truly enjoy your recipes and am anxious for the publication of your cookbook! Thank you so much! It wasn’t the coconut milk – it was the cook! Tried it again & took the quinoa off the burner sooner. The quinoa was perfect – this dish is delicious! Amazing! Tastes great, I heat the almonds in a skillet with the apples and vanilla extract. This is a huge hit in my house! Tastes great for breakfast.